Diolinoir is a modern Swiss grape developed to be more disease resistance. It was “invented” if that’s the correct word, in Pully (Canton Vaud) in 1970 and is a cross between the Diolly and Pinot Noir varieties (pollen from Pinot Noir fertilizing Diolly plants in case you’re interested). A lot of the Diolinoir grown in Switzerland is used for assemblage wines as it blends very well, but you can find it sold is as a varietal as well. 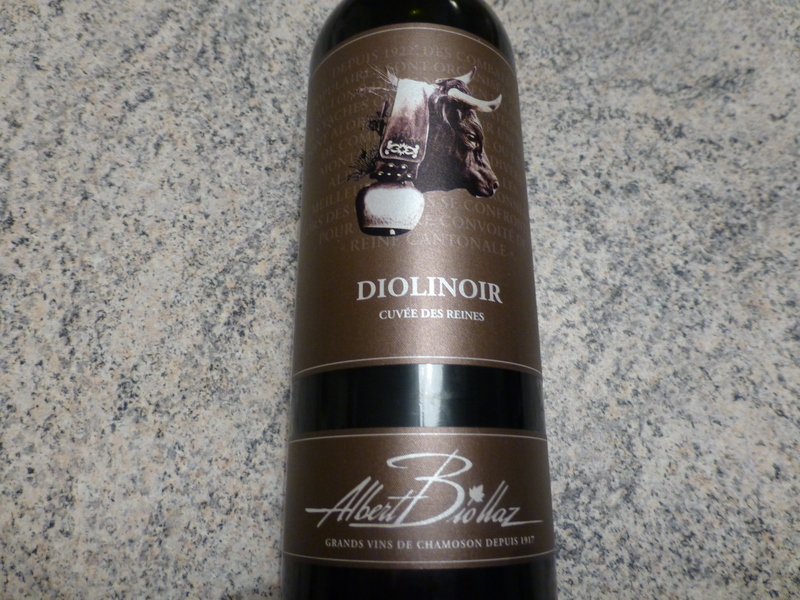 Diolinoir typically has a deep red colour and powerful nose. 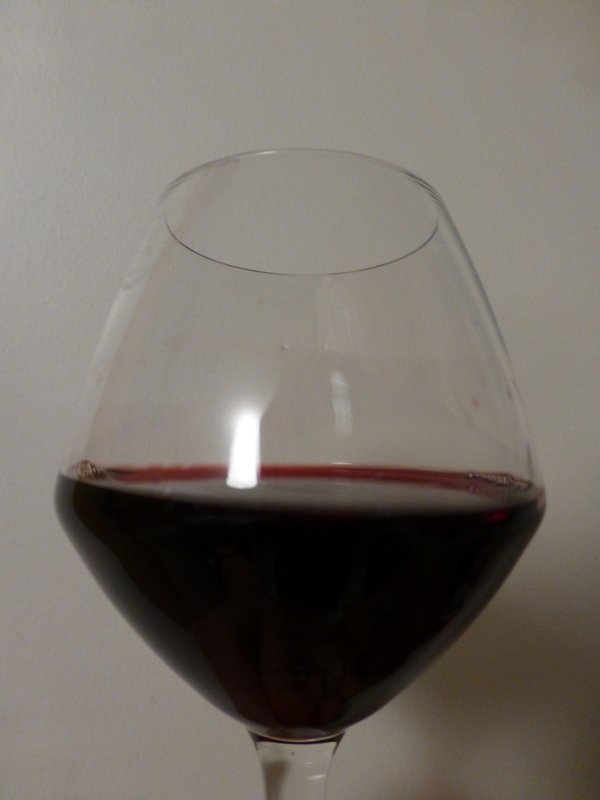 It has fairly light tannins and is said to age well. 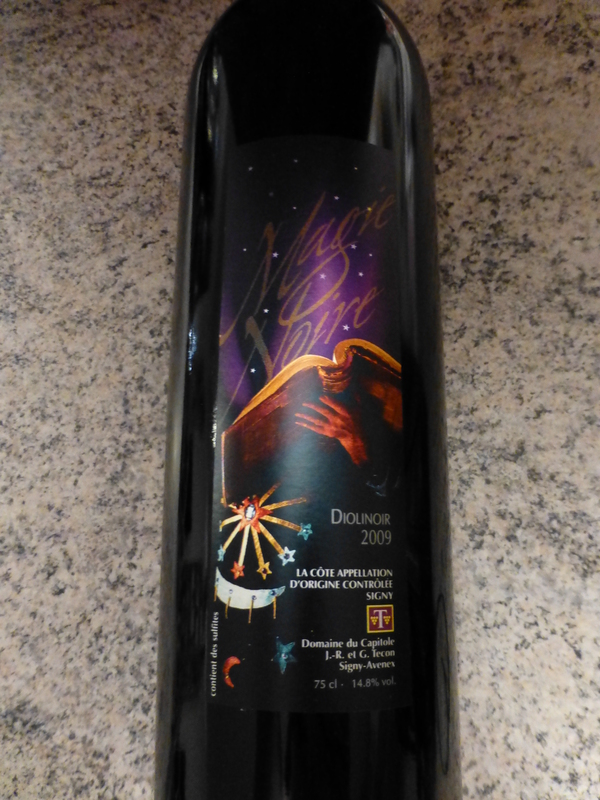 The first Diolinoir I tried was a 2009 Magie Noir Diolinor from the village of Signy in Vaud, just above Nyon (CHF24.50 in a shop (L’Horloge) in Nyon, CHF16 direct from the producer, Domaine du Capitole). I wasn’t in Switzerland in 2009, but it must have been an extremely sunny year. The label picture on the vineyard’s website shows that the 2008 vintage was a hearty 13.5%, however the 2009 vintage that I tried was a staggering 14.8%! This high alcohol content meant that the wine had some of the most amazing legs that I have ever seen, they hung forever. 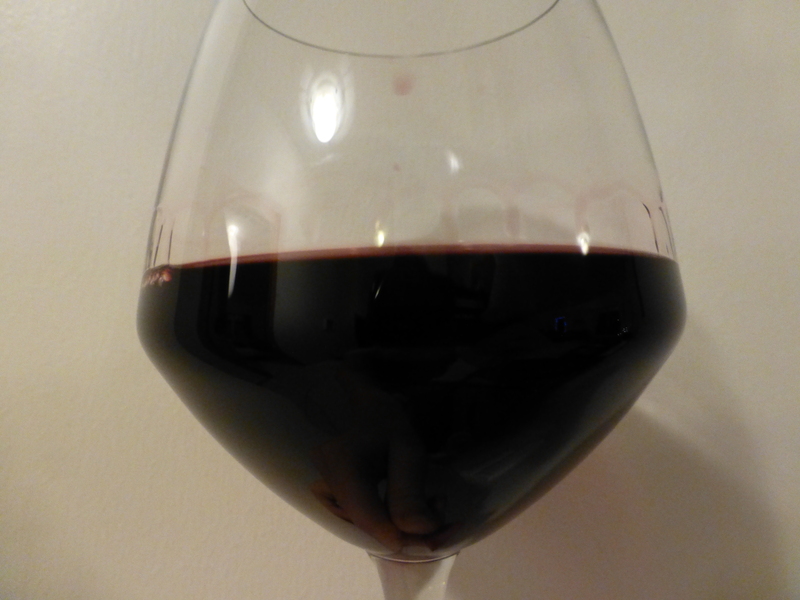 With the wine in a glass the colour reminded me of a Malbec; it was so dark that I could barely see through it. It had a deep berry fruit nose with hints of wood and pear. In the mouth it was soft with very little acidity. You would never have guessed the percentage from the taste, it was very short and there was no tang of alcohol at all. Instead it was pleasant and bright with a hint of spice. Overall this was a very enjoyable wine, just a bit non-descript on the palate. I enjoyed it and would happily drink more if I had some to hand or saw it on a wine menu, however I don’t feel the need to rush back to Nyon to grab some more for my cellar. Not as dark as the Magie Noir, this still had a deep vivid ruby hue. This wine had such an strong aroma (a intriguing mix of fruit and earthy woodland) that I was able to notice it even when the glass was across the room from me. Being much younger this had a lot more acidity than the Magie Noir. It was quite dry and also very short with a little hint of blackberry flavour lruking, but disappointingly, no real punch or flair to back up the power of the nose. Again I would pop this in the category of perfectly drinkable but not terrible exciting. Overall I would say that, while it was fun to try and new grape, especially one developed so recently, I don’t think there’s much to really “sell” Diolinor from a tasting point of view. It’s a perfectly good, inoffensive quaffable red, but it lacks that certain something that makes a wine truly special (or at least these two wines did). For both I felt that they smelt must more interesting than they tasted. That said, not every wine has to be an event. Depending on the meal or occasion, sometimes you need something reliable if a little uninteresting.